Here is the fifth lesson in my new series of short videos to help you understand the "why" and "how" when working with Alcohol Inks. Now it is time to finish the vibrant pear painting from the fourth lesson. The is the fifth in a series to help you understand why and how Alcohol Inks work. 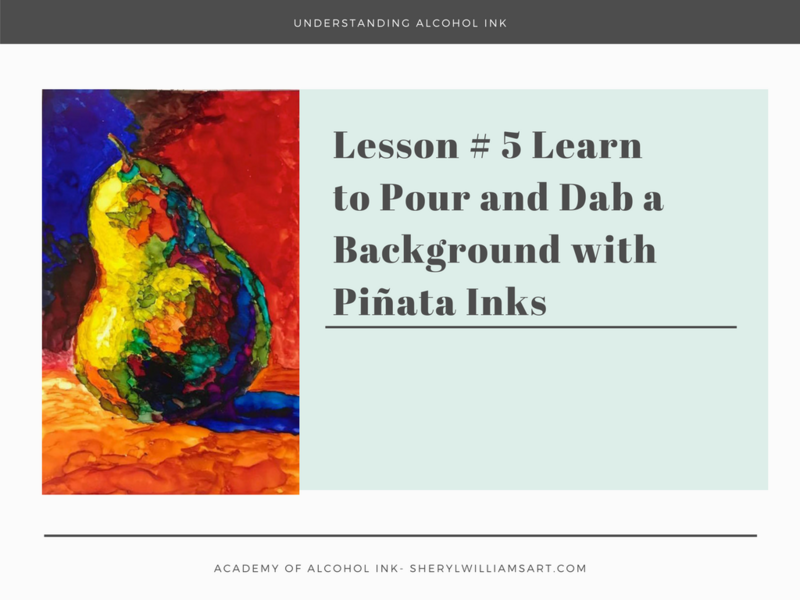 In the this lesson we look at “how” by learning how to “dab” a background with alcohol ink. We select colors for the background for maximum impact – darks next to lights and lights next to dark for maximum contrast. 2 responses on "Understanding Alcohol Ink - Lesson #5 Dab a Background with Pinata Inks"
Thanks, Sue. I just need to figure out how to video sealing the tiles. Then we can compare several different sprays and materials.